Dalbello's Gaia 1, developed for althletic girls who want to rip all around the mountain. Dalbello's Gaia 2, developed for althletic girls who want to rip all around the mountain. 2 Buckle youth ski boot for young shredders. Dalbello's Gaia 3, developed for althletic girls who want to rip all around the mountain. Dalbello's Gaia 3, developed for improving freeride and freestyle skiers. Dalbello's Menace 4, design developed for improving freeride and freestyle skiers. 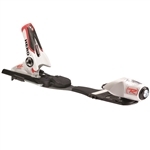 The AXIAL³ 100 B73, an all-new, high-performance alpine ski binding. Playful twin tip ski to help intermediate skiers build on their skills.